St. Joseph Lighthouses, photo by KentV999. St. Joseph’s first Federal lighthouse was constructed in 1859 on the hill above the harbor, and served the area until 1906 when the north pier was extended 1,000 feet, and the cast iron pier head light installed. …The inner pier light was built in 1907, to serve as a rear range for the existing pierhead tower, allowing vessels to line up accurately on the channel from far out in the Lake. Over a a steel frame, the structure was encased in 3/8 inch steel plates. Twenty-six feet square, the building was capped by an octagonal cast iron lantern room, and equipped with a Fourth Order lens manufactured by Chance Brothers of Birmingham, England. At some point thereafter, this lens was removed from the tower, to be replaced by a Fourth Order Fresnel lens manufactured by Sautter & Cie, of Paris, the lens that remains in the tower to this day. Check it out on black and in Kent’s St. Joseph MI slideshow. 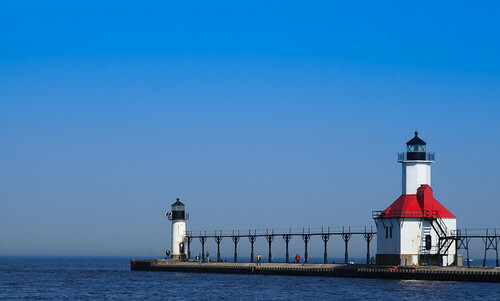 To beat the heat, check out the St. Joseph Lighthouse slideshow from the Absolute Michigan group on Flickr which features a lot of wintertime shots! Previous PostIn The PinesNext PostCan’t Help Falling in Love … with Michigan events!